1.1 1. Pair your cork flooring with an intricate trim. 1.2 2. Play with textures. 1.3 3. Think: home spa. 1.4 4. Match it to your statement pieces. 1.5 5. Match cork flooring to your other flooring. 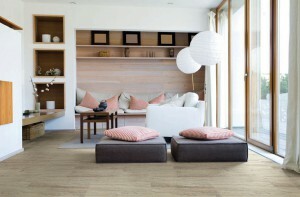 Cork flooring is one of the hottest trends in home flooring. Wondering how to style around it? 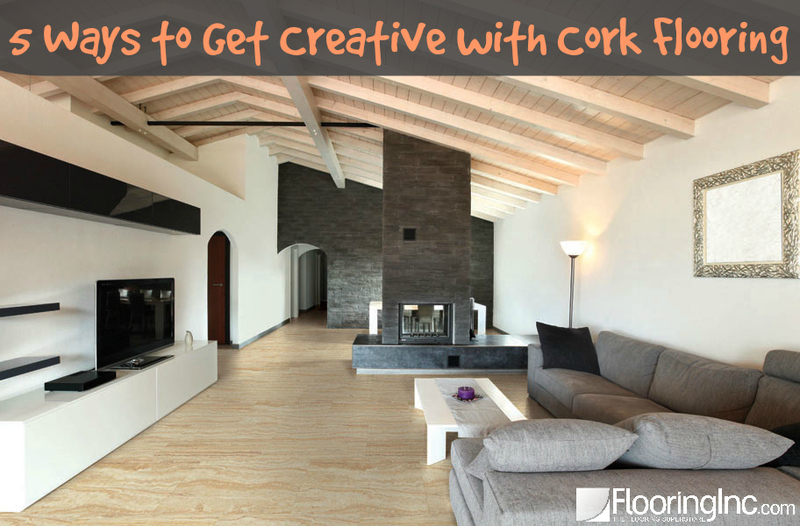 We’ll show you 5 ways to get creative with cork flooring. 1. 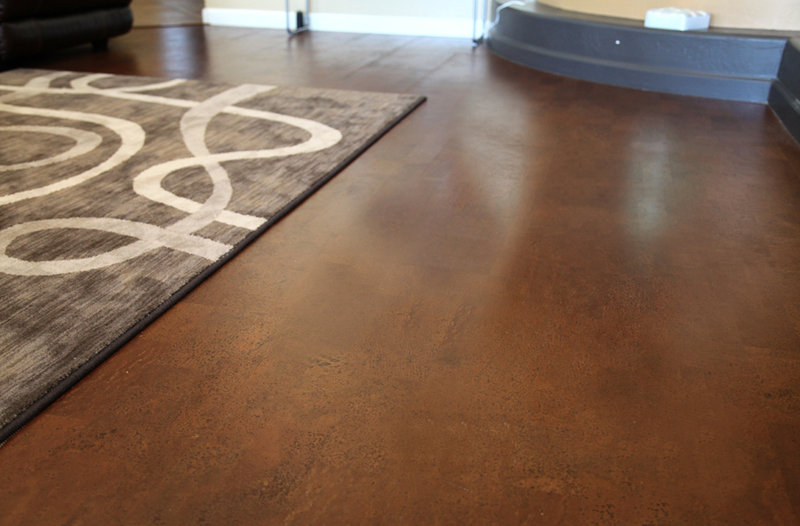 Pair your cork flooring with an intricate trim. The word “cork” may call to mind Pinterest art projects, but as a flooring option it’s much more sophisticated. 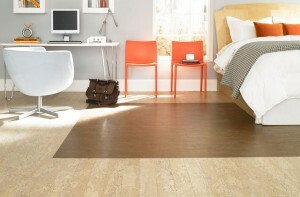 Cork delivers the aesthetic of wood flooring at a fraction of the cost, and with added softness. Harness its elegance by pairing it with an extra-wide or interesting trim. Cork flooring is excellent because it has more “give” and sound absorption than tile, but a hard floor might not be your idea of cozy. Luckily, cork’s subtle textures work great with rugs of all types. 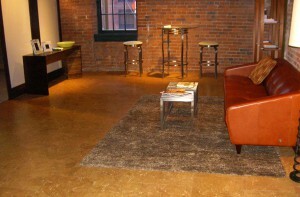 A few well-placed rugs will allow you to enjoy the benefits of cork without sacrificing softness. And it will look great, which is always a plus. Cork flooring calms a space with its sound and shock absorption. Just add wicker baskets, linen pillows, and plush furniture for a serene home-spa feel. Keep the decorations minimal to nail that “clear your mind” zen feel. Bonus: cork really is excellent for workouts, so stash a yoga mat or two in a wicker basket at the end of the couch. 4. Match it to your statement pieces. Cork flooring looks lovely when paired with heavy wooden furniture, because both materials showcase great natural textures. Pick furniture that draws out this wonderful interplay of design. A heavy wooden bed frame will look stately against a cork floor. Likewise, a dark dining room or imposing living room will stand out beautifully against cork. If you keep the flooring and the furniture lines simple, a couple of well-placed fabric patterns will add depth and artistry to your space without looking overdone. 5. 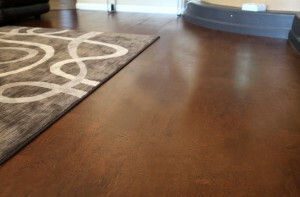 Match cork flooring to your other flooring. Some folks prefer carpet in the bedroom and tile in the bathrooms. If you count yourself among these people, don’t forget that the whole house should still work together, design wise. Since cork can offer a wide variety of colors, it will be easy to pick a carpet color that compliments a hue within the cork flooring. This kind of indirect color match will make sure the flooring flows well without becoming overpowering or boring (like a perfect color match would). When choosing tile to compliment your cork, we recommend keeping the color simple. Cork is such an interesting texture – a too-busy tile might seem to compete. Instead, opt for a simple tone (like white). If that’s too simple for your tastes, get playful with a honeycomb shape tile or an occasion color pop tile.